Two variations of the Mosaic Four Patch quilt block are used to assemble the quilt. 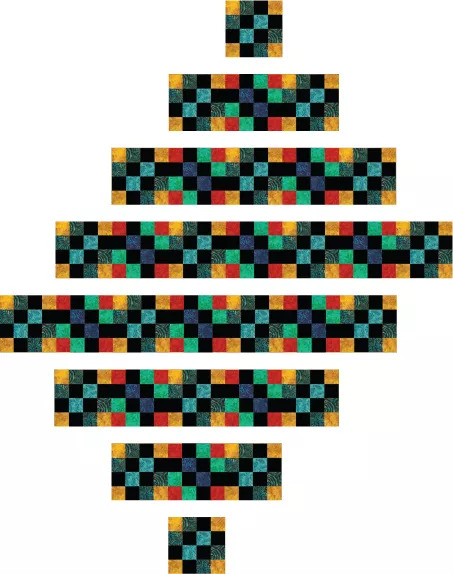 The quilt blocks are strip pieced, and each block contains only two different strip configurations. Blocks are easy to assemble, but it is important to sew with an accurate ​quarter inch seam allowance and avoid stretch when pressing. Block B, on the right, is repeated 12 times in the quilt. The term 'selvage width' strips refers to long strips of fabric cut across the crosswise grain -- from selvage to selvage. Sew 4 strips together and cut across into strips 2 1/2" wide as shown. Sew the rows together, matching seams carefully. Press the quilt block. The block should measure 8-1/2" x 8-1/2". 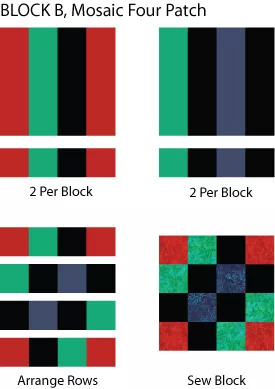 Make a total of (12) Type B quilt blocks. 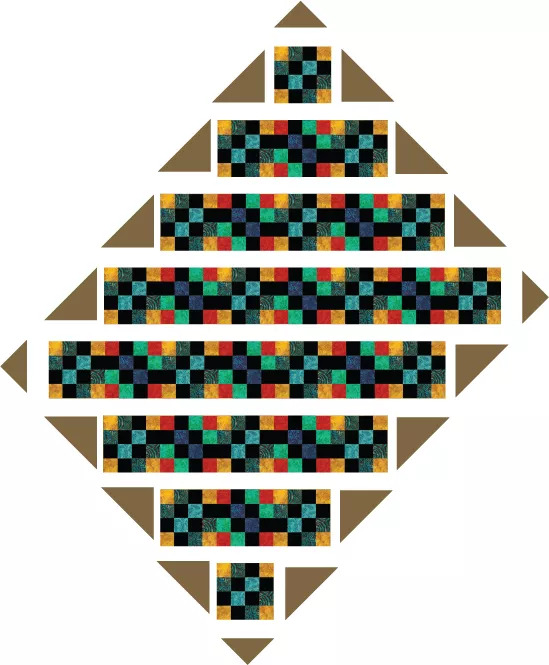 The Mosaic Four Patch quilt pattern results in a quilt with on-point blocks, but I've set the blocks on their sides in this illustration to make it a bit easier to visualize placement. 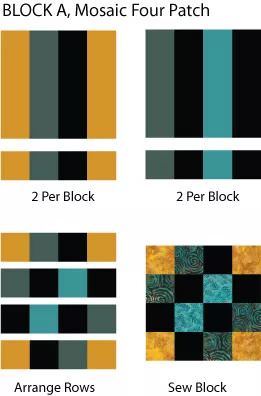 Use a design wall or other flat surface to create seven rows with the two different Mosaic Four Patch quilt blocks. Blocks alternate within each row, but each row begins and ends with a block that has gold corners. Sew the blocks in each row together, carefully matching seam intersections, but do not sew rows together -- setting triangles must be added first. If you waited to press some seams, now's the time to handle that task, pressing as many as possible in opposite directions before sewing to adjoining blocks. Cut corner triangles by dividing (2) 6-5/8" squares once diagonally. Place a setting triangle at each row end as illustrated. Place the smaller corner triangles at the for corners of the quilt. Sew setting triangles to their row ends, matching their 90-degree sides with the straight side of each row. Press seam allowances towards the triangles and trim excess 'dog ear' fabric created by seam allowance at angled edges of the triangles. Sew rows together. The quilt top should look like the quilt on page 1, minus its borders. Fold corner triangles in half along their longest edge. Center and sew a triangle to the four corners of the quilt. Corner triangles are usually a bit oversize and corners may need to be squared up. Do that now or wait until after the quilt is quilted. Create an inner border from 2" wide strips of black fabric. Measure and sew to the quilting using your favorite method or the quilt border instructions. Beginners -- do not measure border length along the sides of the quilt. Follow these instructions and the borders will help square up any inconsistencies or skewed edges. Press seam allowances towards the borders. Use 5" wide strips of greenish gold to sew outer borders (add the long borders first). Press seam allowances towards the borders. Press the quilt. Mark for quilting if necessary. Sandwich the top with batting and backing and baste by hand, with safety pins (for machine quilting) or try a fusible basting product. Quilt the quilt and apply easy mitered binding with your pre-made binding strips.